Buy Jason Revitalizing Citrus Body Wash - 887ml in the UK from our online shop or directly from our independent Scottish store. If you want to automatically receive an email when 'Citrus Body Wash' is back in stock, just leave your email address below. This JASÖN® gentle Jason Body Wash cleanses with natural botanical surfactants and safely nourishes with Vitamin E and Pro-Vitamin B5. This JASÖN® gentle Jason Body Wash cleanses with natural botanical surfactants and safely nourishes with Vitamin E and Pro-Vitamin B5. Our natural blend of sparkling Lemon Extract and zesty Orange Peel Oil keeps your body soft, smooth and energized. Benefits: Energizes with Natural Lemon Extract & Orange Peel Oil. Nourishes with Vitamin E and Pro-Vitamin B5. As official Jason stockist, we sell genuine Bath & Shower directly from our shop in Scotland and online throughout the UK. View more products from Jason. Where can you buy real Citrus Body Wash safely online? If you are wondering where you can buy Jason Revitalizing Citrus Body Wash - 887ml safely online in the UK, then shop with us. We are an actual health foods shop; with real people selling real foods and products. Our award-winning independent shop is located in Stirling, Scotland since 1976. You can buy our Natural care products and other genuine Bath & Shower in store or safely place an order with us online or over the phone. 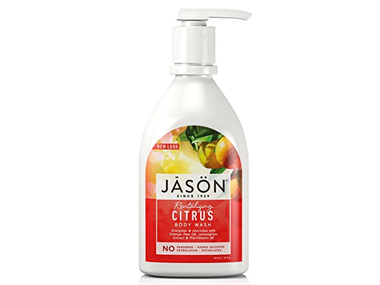 Citrus Body Wash - Jason Revitalizing Citrus Body Wash - 887ml in Bath & Shower and Personal Care.